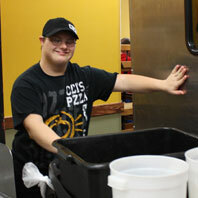 Customers visiting Cici’s Pizza for lunch on Mondays, Wednesdays, and Fridays will find Aaron hard at work. 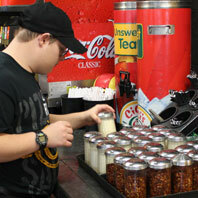 Aaron is an usher, lobby attendant, and ticket taker during the lunchtime hours at Cici’s. His job duties include clearing tables of dirty dishes, wiping tables and chairs, and assisting with dishwashing tasks. Aaron began his work experience, which is supported by the State of Wisconsin Division of Vocational Rehabilitation (DVR), in October 2014 and was hired in January of this year. He said that his favorite task is wiping down tables. He often receives compliments from customers as well as tips. Aaron set aside money from tips for his birthday in April and celebrated by staying in a hotel with friends. He also enjoys spending time with friends with playing video games (especially Tony Hawk) and going to movies. 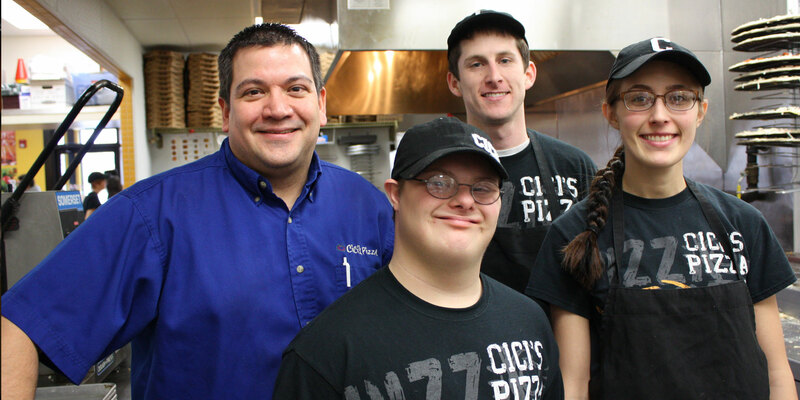 Whether it’s getting water ready for his Special Olympics basketball team or working alongside his Cici’s team, Aaron is appreciated for the great work he does!